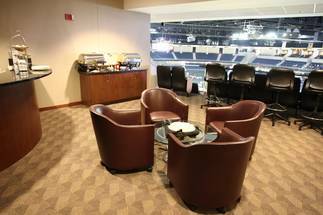 The Suite Sound of Luxury is catching the excitement of your favorite artist performing, or the live action of a thrilling sporting event in the privacy and comfort of your own luxury suite. From reserved premium parking located near an exclusive Suite Holder entrance, to the private elevator for Suite Level access, you will enjoy the ease, elegance and first-class service reserved just for you and your guests. We invite you to become one of our prestigious Premium Suite Holders in one of our 36 Elegant suites equipped with a television, lounge area, food/beverage counter, refrigerator and wet bar. Whether it is a Marquee package, a Build-Your-Own Series package, Rock 'n' Ride or a Suite Life of Luxury package your suite is the perfect setting for any occasion. Please contact Nancy Golden at 770-813-7680 for questions or if you would like to schedule an appointment to tour our facility.